KIconcerts: Paris 2014 – join Dr. Glenn D. Price! Paris 2014 – join Dr. Glenn D. Price! I am writing to invite you and your ensemble to join us for a one-of-a-kind spring tour experience to Paris in 2014. Following the success of our musical tours to China in 2008 and London in 2012, I am delighted to have been invited to lead this special musical and educational project to France. Our most recent project to London last spring proceeded fantastically well. All the arrangements were terrific and the students had a very rich range of activities, from concerts with their own school groups, tons of sight-seeing, lots of fun in general and of course, our combined “Festival Wind Orchestra” experience. To the left is a picture from our final concert, so you can see the truly grand nature of the occasion. It was personally very moving and a great honour for me to be part of such a meaningful life experience for all of the students. The core tour involves an independent itinerary for you and your group, usually of about a week, with the balance of performance, cultural and recreational events that you prefer. 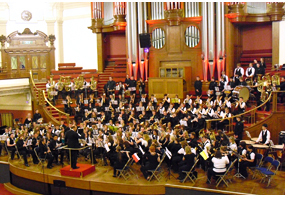 All the touring groups then combine forces for two major shared concerts in a world-class venue and also are combined to form the “Festival Wind Orchestra”, that I have the pleasure to rehearse on site and conduct for the conclusion of the two Gala concerts. More detailed information about costs, itineraries etc. is immediately available, so please let me know if you would like to have a brochure forwarded to you, so that you can have a better idea of the rich range of experiences included in this package event. I will also mention two further aspects that may make participating easier for you. Some school programs have been very successful in applying for external funding. With the French component it may “tick more boxes”, for both government and corporate support. Also, you may wish to team up with your French or History departments, and have other students come along, who would not be part of your performing ensemble, but would share the rest of the experience and enjoy additional activities during rehearsal times etc. It might give a school administration more reason to get behind a large project like this. I hope that you have had a great year and I invite you to be in touch with me if you have interest in joining us in for Paris 2014!